Even though the first quarter of 2017 didn’t start that slowly, it sure felt like it did. But the second quarter was a different story. We were flat-out busy between April and June. Personally, it was my busiest quarter to date. 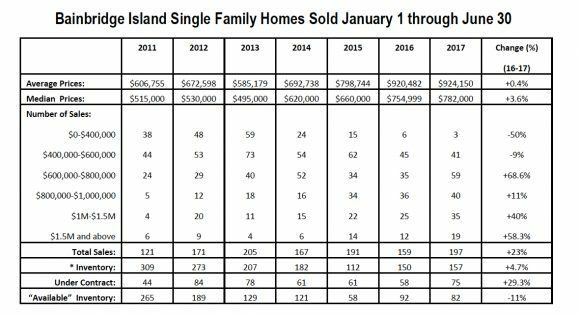 There were 141 home sales on Bainbridge during Q2, which was a 31.8% increase over last year and a 306.5% increase over 2009 (for those of you who remember those days). The only second quarter to get even close in the past decade was 2013, when 125 homes sold. Still, a curious piece of data accompanies all those sales: the median price of homes sold in the first half of 2017 increased only 3.6% over the comparable period last year. That is the slowest growth of prices since 2012-2013 (when it actually went down). Here’s why this is significant: even though there is healthy demand, buyers are showing restraint and patience. This, I think is a good thing. The basics of presentation, pricing and negotiating (which really good agents bring to the table) still prevails. You cannot just take a house in any condition, throw a price at it and expect success. This is one of the factors that differentiate Bainbridge from the Seattle market. 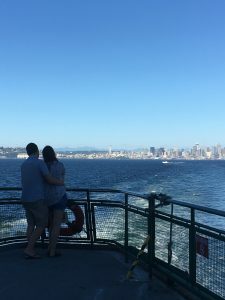 The flip side is that a major source of new buyers on Bainbridge are frustrated Seattle buyers who are tired of dealing with the city’s growth and market conditions. 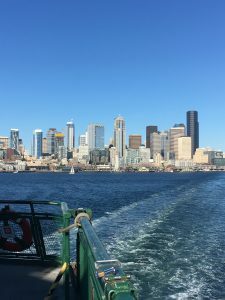 Our office was involved in 96 Bainbridge transactions during the first six months of this year, 30 of which (or 31.3%) involved Seattle and Eastside buyers. 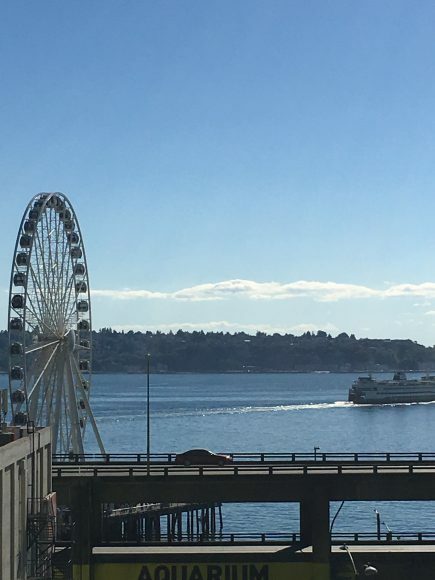 When we expand the circle, we see that out-of-state and Seattle buyers accounted for 51% of our transaction in the first six months. Our condominium marketplace has had a booming first half of the year. Sales climbed from 38 in 2016 to 50 in 2017 (almost a 32% increase) and the median price rose from $404,500 to $499,250 (up 23.4%), finally surpassing 2007’s previous record of $468,000. It took a decade for these numbers to return, and we’re happy to welcome them back. Land is now the only remaining soft spot in our market. Sales were down 39% from last year but median prices rose 14%. We attribute this mostly to no new large parcel sales and the possibility that people are intimidated by the new construction process. The planning and designing phases of any new project are exciting, but then come permitting, the search for contractors and all the costs. With quite a bit of new construction coming on line, people seem to be waiting to see what someone else has built. These projects are all within designated growth areas. Indeed, the only multi-home development out of the growth centers is the 10-home project going in at Torvanger/Sunrise Drive, and that’s being built on a 12-acre parcel. Washington State continues to add jobs at a steady rate. (We) continue to see unemployment fall and I anticipate that we will see this rate drop further as we move through the year. In all, the economy continues to perform at or above average levels and 2017 will be another growth year. Yes we have growth and new construction, but there is diversity in the construction (family homes, homes ideal for downsizers, and homes close to services). When you drive around the island, you find most of it untouched by new developments. We also have the best parks, hikes, beaches, bays and communities in Puget Sound. Our region’s star is still rising as a great place to live and work and we are one of the premier neighborhoods in it. Growth pressure will continue; it’s up to all of us to work together to ad-dress it in ways that honor the past, present and future of this great place. 1858 Commodore Lane is a rare, in-town package. 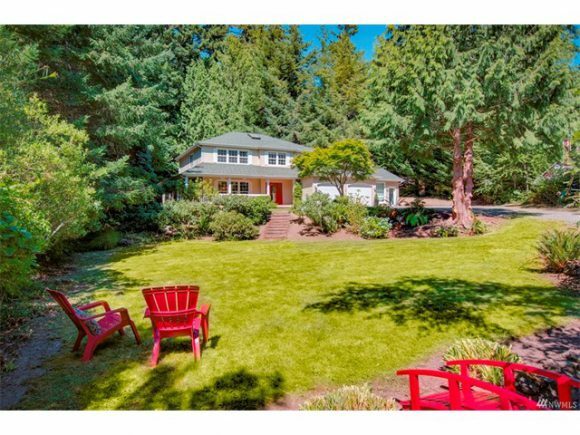 Almost half an acre, walk-able to all levels of schools, Winslow and the ferry. Plus a private, light and bright studio/office. This quiet cul-de-sac location provides both privacy and convenience. Do you want chickens? No problem, you have plenty of space here. Room to play soccer or throw a frisbee to your dog? Yes, more than enough run around room here. Come see for your self. I will be holding it open Thursday, July 20th from 10am-1pm and Sunday, July 23rd from 1pm-4pm. 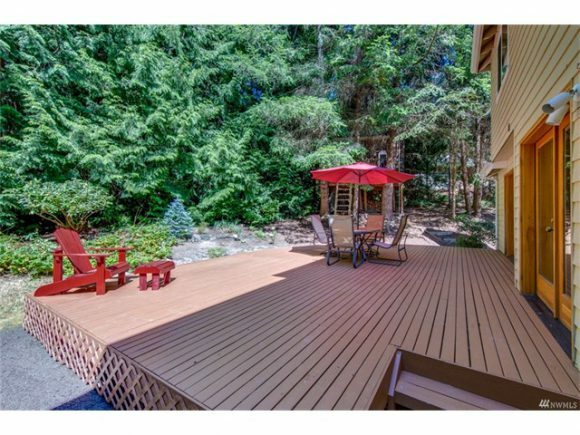 1858 Commodore Lane on Bainbridge Island. The kitchen and family room open to the back deck and are also connected to the living room and dining room. 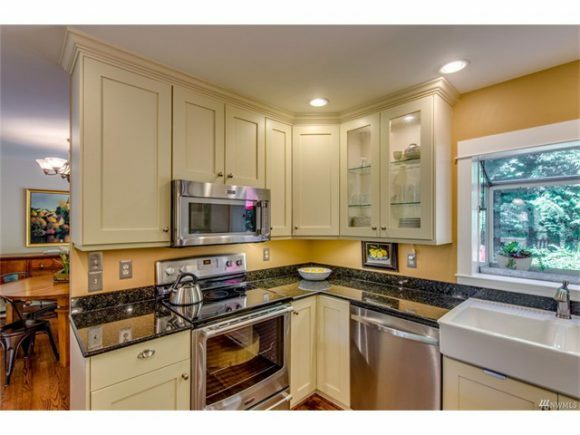 The updated kitchen has newer cabinets and counter tops as well as brand new stainless steel appliances. 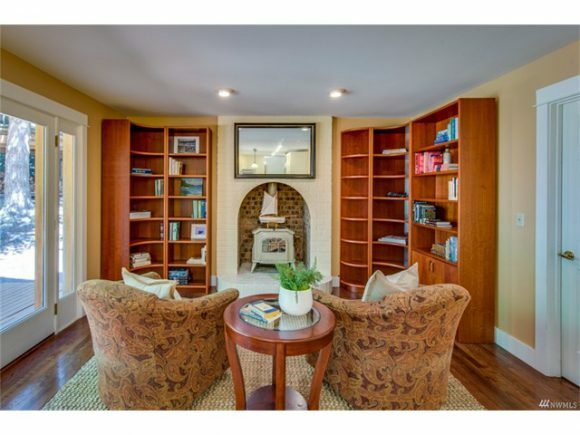 The cozy family room has a wood burning stove and two sets of french doors that lead to the back deck and yard. The light and bright studio is private and you can access it via the garage, front yard or back yard. Private deck and play space in the backyard. Traditional in-town home with charming wrap around covered porch on a hard to find, flat .40 acre lot. Mature landscaping and large, level lawn space. 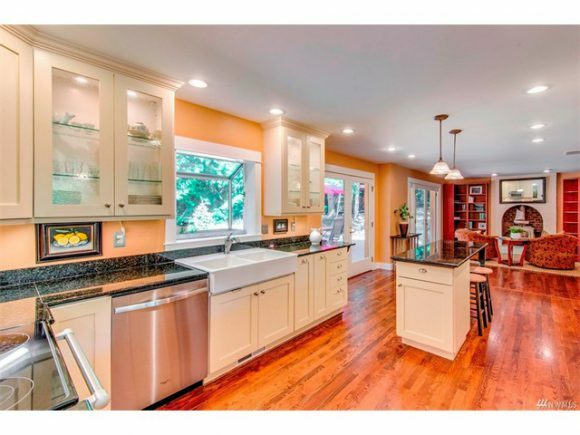 Quiet cul-de-sac living and an easy commute to schools, Winslow, parks, and ferry. Comfortable, open floor plan with updated kitchen, new SS appliances, and attractive hardwood floors on the main. 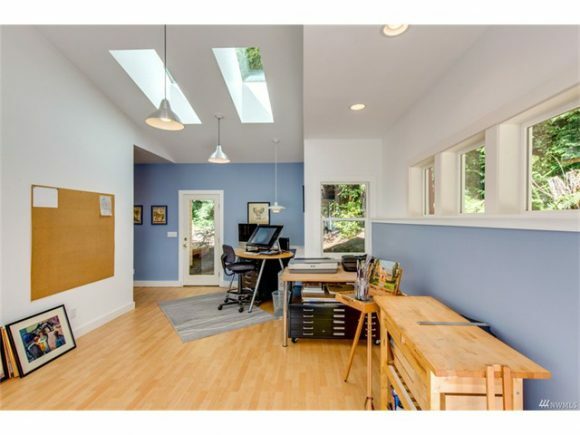 Sellers added light, bright studio that could also function as a private office or recreation space. All bedrooms upstairs. Rare in-town package. From the firetower at IslandWood on Bainbridge Island. I am so thrilled to be sponsoring this fabulous event- the Northwest Newbies Nature Hike. IslandWood is a true treasure on the island and I love that they open their doors to the public many, many days of the year. Tomorrow’s hike already has a waitlist, but I am sponsoring another hike in the fall on September 24th too. 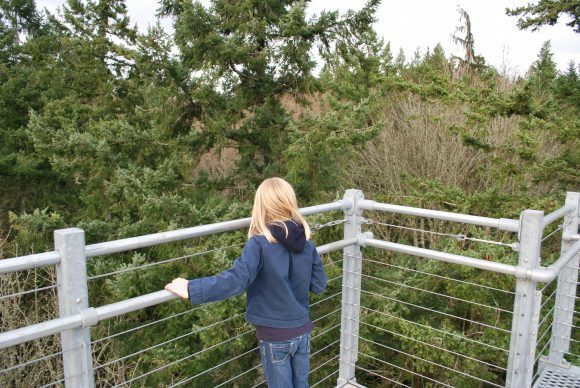 Check in with IslandWood in the morning about tomorrow’s numbers or be bold and how up in person ;) Check out their calendar for special events and Public Site Tours – the next one is July 16th. 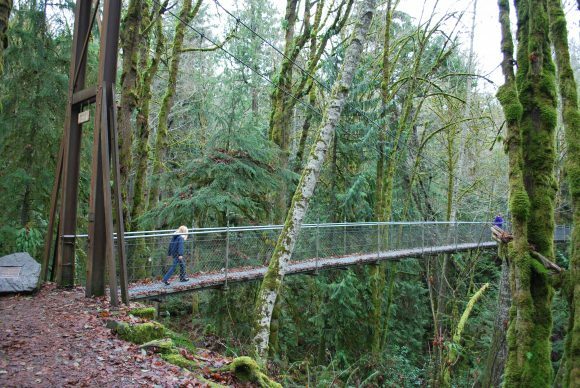 Personally, I love their suspension bridge and fire tower – you’ve got to go. 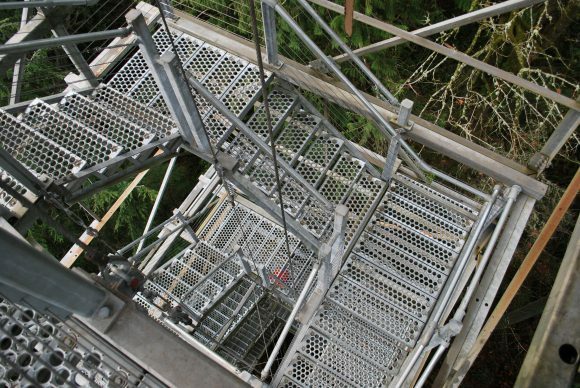 A view looking down through the old firetower at IslandWood. We’ll make time to hear about where YOU are from, and how it is different and the same to Western Washington. Your questions about “what lives here” are highly encouraged. We can’t wait to meet you, neighbor. See you on the trails! Space is limited for this guided walk! Rain or shine people – we’re in Western Washington! We appreciate our sponsor of Northwest Newbies – Jen Pells Real Estate! The amazing suspension bridge at IslandWood.